More than 300 people have been arrested since the start of the Euro 2016 football championships less than a week ago, the French Interior Ministry said Thursday. In a statement, the ministry said there had been 323 arrests on suspicion of theft, damage to property, or violence. Eleven people have been given prison sentences, three of which were suspended, while another 196 are in custody awaiting a court appearance. Two dozen face deportation, the ministry added. Fighting during the day and overnight between British and Russia fans and police in the northern city of Lille saw 36 arrested and 16 hospitalized. 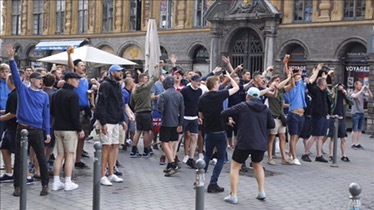 Russian fans were in the city to see their team face Slovakia on Wednesday, while thousands of England and Wales supporters are also in the city ahead of their teams’ fixture against each other in nearby Lens on Thursday. In Lens, schools and shops were closed on Thursday and there were heavy restrictions on the sale and consumption of alcohol. Meanwhile, 20 Russian fans, including the alleged leader of a far-right Russian hooligan group, were awaiting deportation on Thursday, a prosecutor in the southern port of Marseille said. The city saw violent clashes involving Russians over the weekend. Three Russians have been given prison terms by a court in Marseille for their alleged involvement in violence on Saturday night. The court sentenced Alexei Erunov, Sergei Gorbachev, and Nikolai Morozov to sentences between one and two years along with two-year bans from the French territory, respectively. They were among 43 Russian supporters arrested on Tuesday when a bus traveling between Marseille and Lille was stopped by police. Marseille police chief Adolphe Colrat said there was evidence “to show that some of them took part in unacceptable violence in Marseille”. He added that they would be deported if shown to pose a threat to public safety. Russia has been fined 150,000 euros ($168,500) and warned it will be disqualified if Russian fans are involved in further violence, UEFA said.